Like most writers who’ve published a number of novels, I’m often asked where do my ideas come from and how I turn the germ of an “notion” into a full historical novel, as with my Island of the Swans, which is being re-issued by Sourcebooks Landmark in February, 2010. In the case of Swans, I had an eccentric great grandmother named Elfie McCullough who lived to 96 years old and claimed that our McCulloughs from the Lowlands of Scotland had married into the Maxwells of Monreith a few generations before the real-life heroine, Jane Maxwell, was born. Now, this was a woman who hailed from cattle farmers in Missouri and had about five hundred empty tuna fish cans stacked in her pantry in case she ever needed an ashtray. Then there were the five diamond engagement rings we found when she died, tucked away in a pink and white peppermint candy bag (She apparently had a habit of getting engaged, breaking it off, and refusing to return the ring)! Years after Granny McCullough had passed away, I stumbled upon a short monograph about “Jane Maxwell: The Match-Making Duchess” appearing in a folksy Scottish-American newsletter called The Highlander. There, on the front page, was a black-and-white rendition of the famous portrait of the 4th Duchess of Gordon that hangs in the Scottish National Portrait Gallery…and it took my breath away because, if I do say so myself, we looked rather alike! 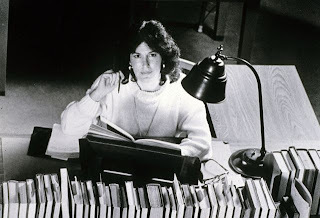 From that moment onwards, and until the novel was published, I was obsessed with tracing Jane’s story, as there wasn’t a full-length biography written. What I did manage to discover after considerable effort was that her life “read like a novel”—so I decided to write one, my very first. Sadly, in all those years of research, I could never absolutely prove I was a descendant of my beloved Jane Maxwell. However, I am completely delighted that Sourcebooks Landmark has produced this beautiful new edition of Island of the Swans and will be bringing out my other titles over the next two years, including my latest historical, A Race To Splendor, scheduled to release in Spring 2011. Many avid readers are interested to know how writers of biographical historical fiction do the research for such a huge undertaking. In my own case, for nearly a decade before I even had the faintest notion I would write Island of the Swans (which I jokingly call “Gone With The Wind of Scotland”), I earned my living as a print and electronic reporter and also worked as a commentator for the ABC radio and television affiliates in Los Angeles. With a History degree from Harvard, and having been trained in the world of journalism, chasing after “who, what, where, when, and why,” my approach to research for the six historical novels I’ve produced during my career has always been: “get the facts and get the story,” even if the story is two hundred years old! The very same techniques good reporting requires are the methods I use for my historical fiction. In Swans, I relied on primary documents to bring to life the world of the incredible figure, Jane Maxwell, the 4th Duchess of Gordon. Letters, diaries, eighteenth century newspapers and journals, playbills, broadsides—these were the grist for my mill. A year into working on the novel, I was granted a “Readership” in eighteenth century British-American history at the amazing Huntington Library in San Marino, California. I had the incredible privilege of free rein among the four million non-circulating volumes of rare books and was given a desk where I could work among some of the world’s greatest scholars, and even pick their brains during lunch at the Footnote Café! I steeped myself in everything from the fashions of the day to the art of Scottish country dancing that was all the rage during the lifetime of this flamboyant eighteenth century “woman of fashion,” a character that grows from a frowned-upon hoyden and minor aristocrat with a distinct Scottish burr, to a woman of stature who gains the ear and respect of political leaders like Prime Minister Pitt, the Younger, and ultimately the King and Queen of England. 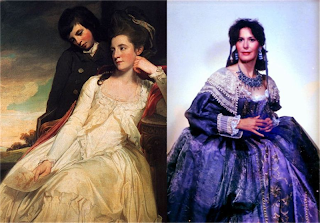 Torn between the love and jealousy of two men, the upheavals of the American War of Independence, and a lifetime of duty to her country as the wife of Scotland’s largest landowner, Alexander, the 4th Duke of Gordon, Jane also was loyal to her adopted home in England where she lived for many years as one of London’s leading hostesses and a political rival of Georgiana, the Duchess of Devonshire. The most difficult part of the story to research was the shreds of evidence that Jane could never escape the pull her childhood companion Lieutenant Thomas Fraser was thought to have upon her deepest emotions. There was even debate over his name, but when several reliable sources pointed to Thomas Fraser of Struy, I took a deep breath and wove a tale of what I believe was a love triangle that endured for more than three decades. Since Island of the Swans unfolds on such a grand stage, the research for this book demanded an in-depth knowledge of politics, military tactics, and even Scottish poetry, as Her Grace was also a patroness of the poet Robert Burns and the driving force behind his first published works. I must have made seven trips to Scotland over the five years it took to write the novel. I haunted the Scottish National Library, the National Portrait Gallery and Register House in Edinburgh, and scores of local museums to ferret out documents such as the inventory of all the items that had been in the Duchess’s country home, Kinrara, in the Spey Valley (where excellent whisky is made) at the time of her death in 1812. The lists described in detail the color of the draperies in her sitting room, the type of chinaware she ate on, and the sheen on the copper pots that had hung in Kinrara’s kitchen. In the course of delving into endless library card catalogues, I discovered a cache of Maxwell and Gordon family letters that had not been removed from the dusty stacks in the Scottish National Library in over one hundred years! Another great find were the political cartoons of the day depicting Jane Maxwell as a conniving “Matchmaking Duchess” for having married her five daughters to three dukes, a marquis, and a baronet. Digging for the facts and the “telling detail,” as I had done as a modern day reporter, turned out to be marvelous training for this type of historical sleuthing. Going into the project, I knew how important it was to take meticulous notes, keep track of where I found the material I ultimately used in this fictional account of a historical figure, and to never put in anything in this work of biographical historical fiction that I knew to be untrue. Ciji Ware has been an Emmy-award winning television producer, reporter, writer, and radio host. A Harvard graduate, she has written numerous historical and romance novels as well as non-fiction. When she's not writing, Ciji is a Scottish history and dancing aficionado. She lives with her husband in California. I really want to thank Ciji for this awesome guest post! The research part of the writing process has always interested me the most. How cool is that to be allowed in exclusive libraries, to be surrounded by all of that history?! Aaaahhh, bliss! Thank you Ciji!! I'm acutally reading Swans right now and loving it! This woman knows how to write, let me tell you! She's already made me laugh and cry and I'm not even halfway into it! And the protagonist, Jane, is simply wonderful...I just love her! It's killing me to sit here at work and NOT hide somewhere and read it! Now that Ciji has gotten all of you just dying to read this book, yours truly has got you covered! Thanks to my favorite book publisher, Sourcebooks, I have 2 copies available to giveaway to 2 lucky readers! Giveaway is for US and Canada entries only. Giveaway ends on February 17th. Just leave and comment and your email to enter! I also love reading about the research process. Thanks for the great post. Sounds like a great book. Sounds very interesting. Please enter me to win. I have so enjoyed reading all of these reviews and guest posts! Sign me up! All these blog posts have me very intrigued. please enter me in the contest for this book, it's right up my alley and I would LOVE to win it :). Thanks !! I can't resist entering for this one. Sounds like a wonderful read. Sounds like a most delightful book! Sounds like my kind of book, I'd love to win! I love Ciji's post, it draws you immediately into her story, and loved the pictures too! How fascinating to research such a wonderful woman, and to think there might be a relation - it must like a dream come true for a writer. I really enjoyed this post and now, I can't wait to read the book. Please add my name to the drawing. Thanks for notifying your Facebook followers about this giveaway. I'd love to win! I would love to win this one!! It would make a great birthday present to me (2-17).. I love your website. It sure adds to my TBR. I'd love a chance to win the book. What an interesting post. How great to be able to research enough to be able to write a relatively accurate story about someone's life. Ciji, I hope you find the necessary DNA to get it checked. I look forward to reading Island Of The Swans. Thank you so much for hosting such an interesting post. It was fascinating to read about what inspires a writer to chose a topic and the ensuing research that is needed. I would love to read this book. Please enter me. Impressive review... Would love to win the book! And read it!! What an interesting post looking into an author's mind! The book sounds great and I like that you like it as well. Very interesting guest post; I agree with Ciji that there is a definite family resemblance. One of my ancesters also comes from Scotland. I would love to read this book, it's on my wish list, and I'm hoping I'll win a copy. Thanks for the giveaway. This looks fabulous. Thanks so much for the giveaway! Very cool post! Her great grandmother sounds like a hoot and it was really interesting to hear about her writing process. Please enter me in your giveaway, the book sounds incredible!! I'm sooooo jealous of being able to go back and forth to Scotland for research and spending time in the Huntington Gardens etc. What a journey! How absolutely fabulous and what a tribute to her own family! I just saw this book in a Barnes and Nobles store, would love to win. Amy please add me to this one too. The more I read the more I like her. Scotland ha that would be a blast. more books to read then! Great guest post! Do NOT enter me in the giveaway -- I have a copy of her book from when it first came out. Ciji is a really nice person, isn't she? This looks fabulous - thanks for such a great giveaway. Great interview! Looks great! Please enter me in the giveaway! What interesting lives, both the author's and the duchess's! Please enter me in the drawing. I love the cover of this book, and would so love to read it. Please enter me in your giveaway. Thank you! What an awesome posting! I think it would be amazing to research a novel like this. I don't think I could write one but I'd love to research. Thanks for the giveaway! I'd love to win this "Gone with the Wind of Scotland" book. What an awesome interview. I think I would really enjoy this book. This sounds really good! I would love to win it! Thank you! What a great post! It is so interesting to read about author's process. The book sounds great. I am going to add it to my to be read list. Please include me in the giveaway. This book sounds absolutely wonderful! Please enter me for the giveaway, and thanks. What a great post. This is a new to me author. I would love to win a copy of this book. Your review definitely makes me want to read this one! Thanks for the giveaway opportunity! would love to enter--would love to win! This novel sounds fabulous! Please enter me in the giveaway! Fascinating story about how you came to the story. Can't wait to read the book! Please add me to your giveaway drawing. Loved the story of Granny McCullough. I'd say she was probably right about the descending lines. Your book looks fascinating. Crossing my fingers for a win and thank you so much for the contest. It's much appreciated. OOOPS! Forgot to add my e-mail to my comment. This is a vintage instance of disconnection. The guts wishes some thing mental performance [url=http://www.thebattleshipgame.com/]order tramadol[/url] perceives has run out of get to. In such cases, if we never study the words regarding emotions, which usually instructs all of us for you to authenticate, and to really feel as well as launch, rather than thinking our sensations, your brain will invariably acquire out and about.